July 17, 2017 (LBO) – Sri Lanka is preparing for a seventh session of talks with China on a Free Trade Agreement, the Ministry of Industry and Commerce said. 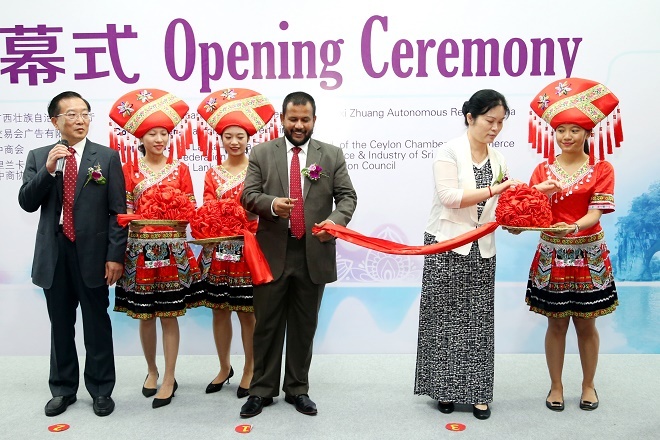 Minister Rishad Bathiudeen, speaking at the product exhibition by China’s Guangxi Zuang Autonomous Region at SLECC in Colombo, said FTA talks with China were progressing smoothly. The ministry said 42 percent of Sri Lanka’s total imports in 2016 came from China at a value of 4.2 billion dollars, with bilateral trade with China at 4.4 billion dollars. Sri Lanka’s exports to China last year were in Ceylon Tea, coconut, footwear parts, apparel, and rubber tyres, with growth shown in tea over the last five years. Though Sri Lankan exports to China declined in 2016 to 199 million dollars from 293 million dollars in 2015, exports have been on an upward trend increasing from 35 million dollars in 2007. Top imports from China last year were mobile phones, boats & vessels, handmade fabrics, and petroleum, the ministry said. FTA negotiations on the Sri Lankan side were moving ahead with domestic stakeholder consultations, the ministry added. The Guangxi Zuang Autonomous Region product exhibition in Colombo was attended by the Deputy DG of the Department of Commerce of Guangxi, Xiong Jiajun, a 40-person delegation including event exhibitors, and Charge d’affairs of Chinese Embassy in Sri Lanka Ms Pang Xunshie. Autonomous Regions in China are administrative divisions with their own local government, more legislative rights, and higher population of a particular minority ethnic group. China has five autonomous regions: Guangxi, Inner Mongolia, Ningxia, Tibet (Xizang) and Xinjiang.